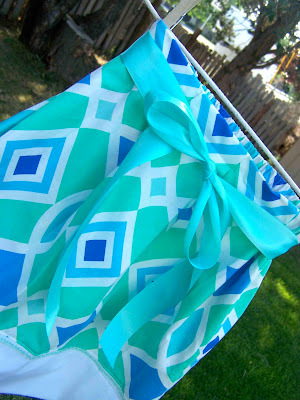 The last skirt I'm going to show you this week, is for the oldest of the three sisters. Clark was really concerned about this skirt, and the fact that it is green and blue. EVERY time he saw me working on it he'd express his concern that she would not like it. "I think it looks a little bit boyish", he'd say. I happen to love the scale of this print, and the colors. I'm hoping that this little eight year old can get past the fact that it's mint green, aqua, and cornflower blue (the girliest greens and blues you can have). I added a small mint crochet trim between the print, and the solid white band. 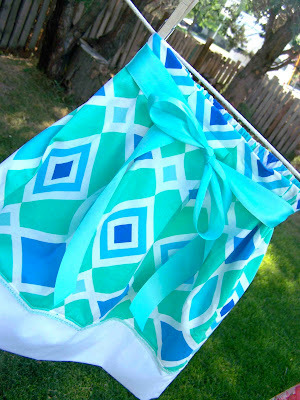 There are four pleats on the front of the skirt, and the back features an elastic casing. It was fun to work with the print of the fabric when determining pleat placement. 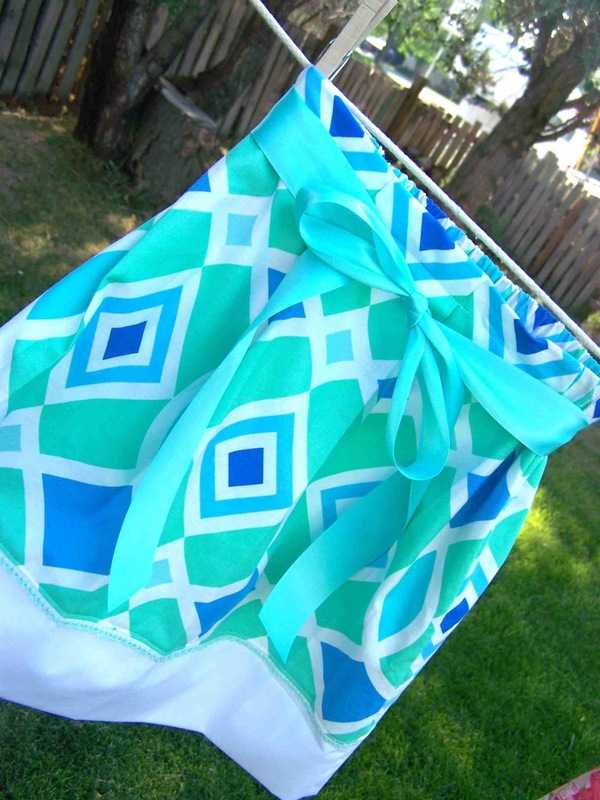 We added pockets, and an aqua blue ribbon sash. 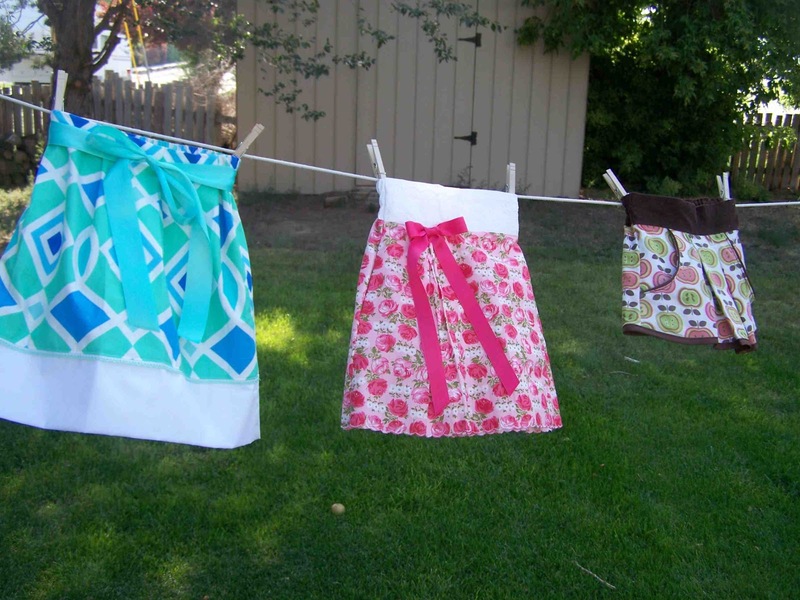 Three different skirts, for three different sisters. Hopefully they like them, and put them to good use. Again, so cute! I love the bow and the tiny trim peeking out. =) I don't know any girls who wouldn't love something like this. Sometimes husbands(I'm assuming the man mentioned in your post is he)have a hard time envisioning the finished product. I think the fabric you chose is fresh and fun and totally girly, especially with the added bow. All 3 skirts are super cute. The blue definitely looks girlie. What lucky sisters! All of the skirts are gorgeous, but I particularly love the last one! Even as an adult I would happily wear it! They were even more beautiful in person. You are so very talented, please forgive me for being too chicken to tell you that in person on Saturday. :) You are just as kind as I remember.